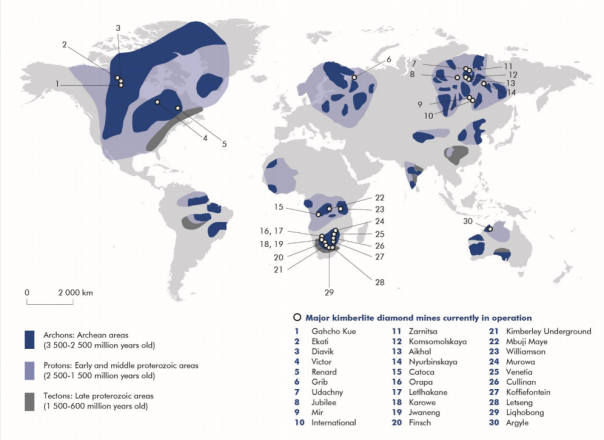 A key characteristic of diamond deposits is their scarcity, in contrast to many other commodities, and there are just 30 significant diamond mines in production today. Only seven mines in the world are considered to be Tier 1 deposits (+US$20 million Reserves). To date, the most important discoveries (other than Argyle in Australia) have clustered into three regions of the world: southern Africa, Siberia, and western Canada. Click on graphic to increase size. The De Beers Diamond Insight Report 2017 noted “a relatively benign macro-economic environment should support global demand for diamonds in 2017. Geopolitical and policy uncertainties drive potential downside scenarios for the industry in the short to medium term. 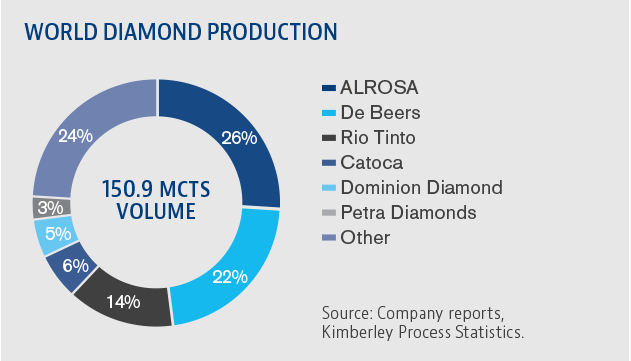 De Beers, ALROSA and Rio Tinto (“the Majors”) remain the dominant players in the diamond market, accounting for circa 62% by volume in 2017. Petra, Dominion Diamond, Lucara Diamond, and Gem Diamonds. Based on FY 2017 production of 4.0 Mcts and sales of US$477.0 million, Petra accounted for 3% of world supply by volume and 4% by value.